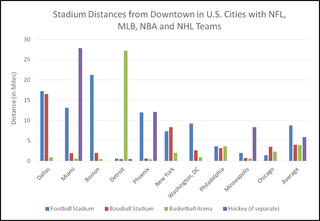 This chart from Redditor jamintime shows distance between stadiums and downtowns in cities with NFL, MLB, NBA, and NHL franchises. Google Maps was used to track distance and define downtown and stadium locations. In cities with multiple pro teams in the same sport, the closest stadium to downtown was used. This chart only looks at four-sport cities, so its sample is small and the averages don't represent their respective league averages. But it at least shows how cities supporting four sports compare to one another.